Missouri is a fertile land with many plains, mountains, prairies and important rivers. When you move to Missouri, you can feast your eyes upon the tallest national monument; St. Louis Gateway Arch and the Harry S. Truman’s Library. Show me State: When Congressman Willard Vandiver said, “Frothy eloquence neither convinces nor satisfies me. I am from Missouri. You have got to show me”. The Cave State: Thousands of caves have been found. 5,600 have been registered, and more are being discovered annually. At least 20 of these are “show caves” open to the public with guided tours. The Lead State: Missouri is the premier lead mining state of the entire world. The Bullion State: When Senator Benton was elected, he opposed banks and paper money and was known as “Old Bullion”. Missouri is the 18th most influential state and 21st largest of all 50. 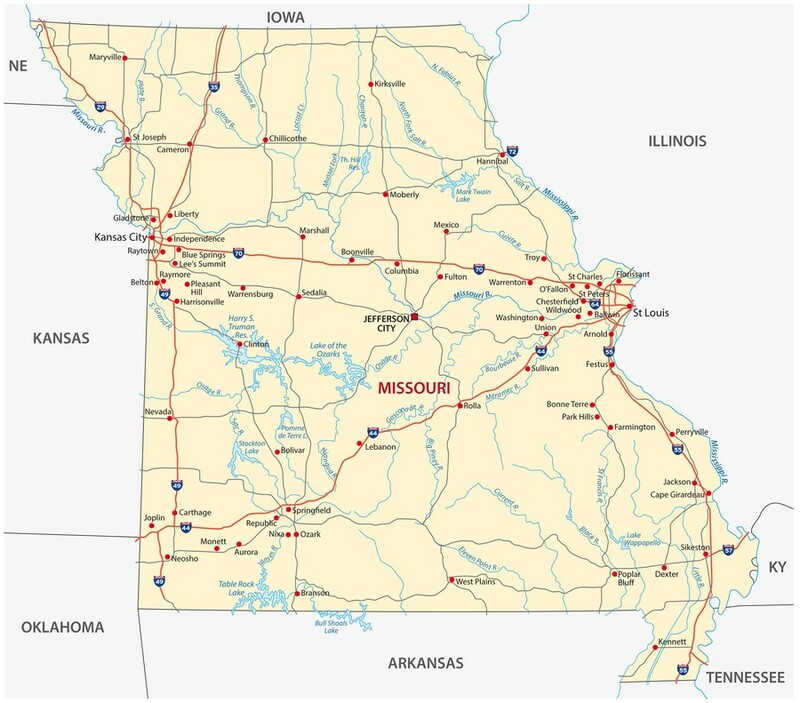 Missouri has a geographically diverse area and has plains, rivers, prairie lands and fertile agricultural soil. Humans have been settling in Missouri for the past 12,000 years. The French and Spanish ruled Missouri for a short while before Americans from the Upland South retrieved it. The Santa Fe Trail, Oregon Trail, Pony Express, and California Trail all began in Missouri. 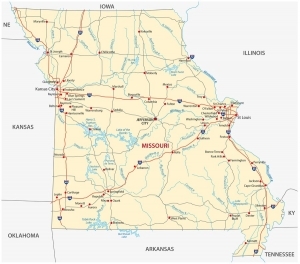 Many notable people hailed from Missouri: US President Harry S. Truman, Mark Twain, Walt Disney, Chuck Berry and Nelly. If you’re buying or renting a house, check for a storm shelter and ensure that you have enough insurance coverage. Missouri has a humid continental climate with cold and snowy winters and hot, humid summers. However, the southern part of the state, the weather becomes humid subtropical. In Missouri, the cities are categorized into three types: Class 3, Class 4, and the ones under Constitutional Charters. The largest cities in descending order are Skyline of Kansas City, St. Louis, Downtown Springfield, Independence (Satellite City of Kansas City), Columbia, St. Joseph, Joplin and Jefferson City. Some of the older cities are incorporated under the legislative charters (Chillicothe, Carrollton, Liberty, LaGrange, Missouri City, Miami, and Pleasant Hill) which are no longer allowed. Their population determines the level of incorporation as at the time they incorporate. The legislative charters do not change even if they gain or lose numbers, except the votes, are held by the people. For a municipality, it incorporates as a Class 4 city provided the population is between 500 and 2,999 (if it’s fewer than 500, it must be included as a village). It could be incorporated as a Class 3 city if the population is between 3,000 and 29,999. There is, however, more regulatory flexibility for Class 3 cities than the Class 4. If you are planning to move to Missouri with kids, you can be delighted because there are some elite educational institutions to choose from. Higher Education: University of Missouri, Lincoln University, Saint Louis University, Washington University in St. Louis which is ranked among the top 20 in the nation. Missouri has a variety of dishes which you can choose from. So many choices! Most of these dishes were invented in the state and are unique to Missouri’s towns and cities. 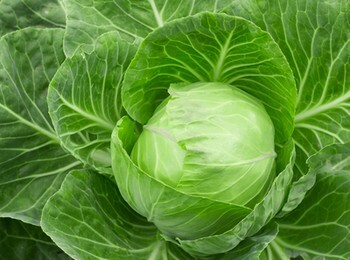 If you like locally grown fresh food, check out these farmer markets in Missouri. It’s quite easy to navigate Missouri with the interstates that run through it. This easy transportation has reflected in residents’ access to employment, fun activities and total participation in societal life. The principal means of transport includes road, air, rail and ship transportation modes which all connect the city of St. Louis with the surrounding communities in Greater St. Louis. It also links up national transportation networks, and international locations. St. Louis also supports a public transport system that covers bus and light rail services. Missouri’s public transit has also been of immense help to people with disabilities. Some of the available transportation resources in Missouri include the Columbia Transit, Jefftran, Joplin Transit, Metro Transit, MO Rides, OATS, St. Charles County Transport, St. Joseph Transit, Springfield Transit and Segways. Missouri has three international airports; Kansas City International Airport, Jefferson City Memorial Airport and St. Louis Lambert International Airport. Missouri’s cost of living based on a US average of 100 is 89.60% with housing being responsible as the biggest factor in the living cost difference at 73%. It should also be noted that while Missourian’s actual revenues aren’t rising as they ought to be, the living cost in Missouri is relatively still less than every other state. The Show-Me State has a progressive income tax and a sales tax throughout the state, plus additional county and city rates. Missouri’s average property tax rate (0.99%) is slightly below the national average (1.19%). Presently, Missouri’s income tax rate ranges from 1.5% – 6%. With the cuts that have begun to take effect in 2017, the top rate is expected to fall from 6% to 5.5% over a period of 5 years. The residents and people who work in Kansas City or St. Louis also have to pay a 1% earnings tax, which keeps their tax bills somewhat higher than average. Missouri’s Property taxes are a major source of revenue for local governments (payments for schools, city administration, law enforcement, and other crucial local services). However, Missouri rates in Missouri vary significantly based on where you stay. For instance, in St. Louis County, the average effective tax rate is 1.38% while it’s just 0.50% In Shannon County. The largest ancestry groups are 27.4% German, 14.8% Irish, 10.2% English, 8.5% American and 3.7% French. Within 30 days of arrival, apply for a MO Driver’s license; arrival, it costs $20 to get a six-year license. Register your vehicle at the local county clerk’s office within 30 days of moving. Perform an emissions test as well. It would cost $24.75 for a four cylinder vehicle, 27.75 for a six cylinder car, $11 for a title and $2.5 to record a lien.